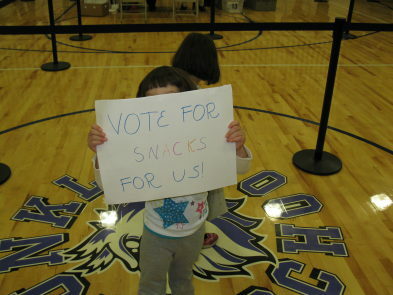 Instilling Civic Duty at an Early Age in the 2012 Election. My grandmother, Clara Baker (known as Clara Baker Cohen after she got married), grew up in Somerville. She attended junior high and high school with Harry Ellis Dickson and convinced him to follow her to the New England Conservatory. Years later, she toured the country with a violin trio, while Dickson joined the Boston Symphony Orchestra and conducted the Boston Pops. Dickson also became father-in-law to Governor Michael Dukakis, who as we all know, was the Democratic presidential candidate in 1988. I thought of my grandmother last week as the election was approaching, because I recalled my role in getting her to vote in an election that took place a few years before she died. She was feeling tired that day and disinclined to schlep out to the polls. Even though I was too young to vote, I already knew how important it was to cast one’s ballot, and I tried to think of a way to convince my grandmother to go. And then it occurred to me. My grandmother was born in 1907, thirteen years before 1920. For me, the Nineteenth Amendment to the Constitution, guaranteeing women the right to vote, was part of history. For her, it was part of adolescence. She actually lived at a time when she saw the women around her legally refused the right to vote. When I pointed this out to her, she agreed to go to the polls and called one of the local campaigns that was providing cars to assist voters. Why was I so convinced of the importance of voting? It was thanks to my parents, but mostly to my mother. When my brothers and I were kids, Mom would make a point of taking us with her to the polls. I still remember trekking to the gymnasium at P.S. 101 in Forest Hills, Queens, and walking into a voting booth with big red curtains. Mom would pull the large lever, the curtains would close, and she would push the small levers in the booth to select her candidates. When she was done, she would let me pull the large lever back. With a satisfying “KA-THUNK!” sound, the votes would be cleared and recorded as the curtains opened, and I felt as if I too had been a part of the process. Nomi and I are dedicated voters, having voted in every single election we could from the time we were of age. I want to make sure that Muffin and Squeaker will be just as dedicated when they turn 18, and last week we pondered whether or not to bring the girls to the polls for their first presidential election. We have brought them to the polls before, for the special senate race of 2010 and for local elections in which I was running, but I felt that this might be the first election they actually have a chance of remembering when they get older. I put the question to Nomi, who felt that the logistics of walking the girls from home to the polls would be challenging, and I agreed with her. But I also put the question to friends on-line, and overwhelmingly they recommended we bring the kids with us. Even Brookline Selectman Jesse Mermell got into the act, with a Public Service Announcement advocating that parents bring their kids to the polls. So this year, Nomi and I changed our plans. Instead of voting first thing in the morning, as we usually do for presidential elections, we voted after work and took the kids with us. Sure enough, the logistics were problematic. It was a cold night, and Squeaker threw a tantrum about wearing her coat and gloves. She insisted on wearing my gloves, which kept coming loose, so as we walked she continued to throw more tantrums. Eventually, I just picked her up and carried her. Muffin, to her credit, did not throw a tantrum, but she did slow us down by saying she had to use the potty. Nomi had to go back to the apartment to get the diaper bag. 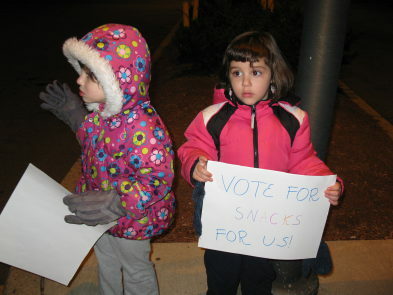 Once we got to the polls, the girls looked around with great interest and enjoyed displaying the “campaign” signs Nomi had made for them, which encouraged people to vote for snacks. For the most part, the girls waited patiently on line. After we got our ballots, we showed the girls how we filled in the bubbles indicating which candidates we wanted. 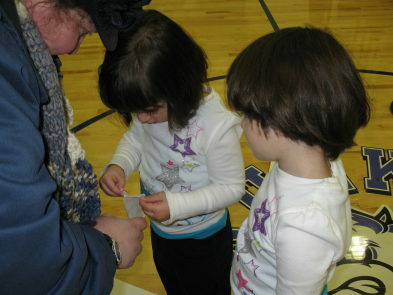 I offered the girls the chance to feed the ballots into the counting machine (“SLURP!”) but the girls declined. They were delighted by the “I voted” stickers, however. And on our way home, they insisted on a stop at the Shaw’s grocery store for melon, strawberries, and cucumbers, and that’s what they ate for dinner. Will the girls remember going to the polls for the 2012 election? I hope so. But if not, I take comfort from knowing that if we take them every year, when they get older they will remember that going to the polls was always an important part of their childhood. This entry was posted in Columns and tagged children politics, children votes, politics, politics and kids, teaching kids about politics, Voting, voting with kids. Bookmark the permalink.